ATP release through pannexin-1 channels is required for T cell migration. (A) ATP release at the cell surface from human CD4+ T cells before and 1 minute after stimulation with SDF-1α was visualized with the ATP probe 2-2Zn (left column; ×100 objective; scale bar, 10 μm). Cell migration was tracked for 30 minutes in the presence or absence of SDF-1α. Paths of individual cells superimposed (center column; ×63 objective; scale bar, 10 μm) or aligned with their origins at x = y = 0 (right column) are shown. Data are representative of 5 experiments. (See also Supplemental Video 1). 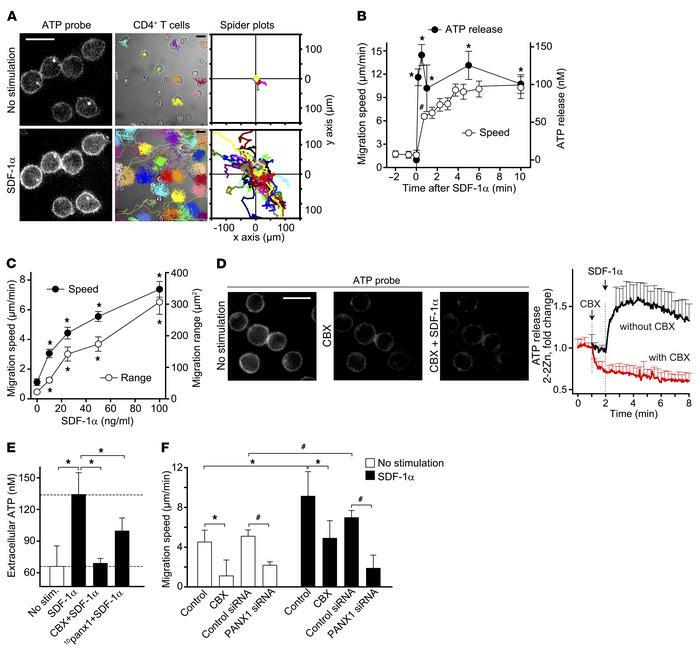 (B) Migration speed and ATP release of CD4+ T cells in response to SDF-1α. (C) Speed and migration range of CD4+ T cells treated with increasing concentrations of SDF-1α (30-minute observation). (D) CD4+ T cells were stained with 2-2Zn and the response to CBX (100 μM) or SDF-1α was analyzed with fluorescence microscopy. Representative images before, 0.5 minutes after addition of CBX, and 1 minute after addition of SDF-1α (left) and traces of cells derived from 2 separate experiments (control, n = 31; CBX, n = 39) are shown. Data are mean ± SD; ×100 objective; scale bar, 10 μm. (See also Supplemental Video 2.) (E) ATP concentrations in the supernatants of CD4+ T cells treated with CBX (50 μM) or 10panx1 (100 μM) and stimulated with SDF-1α for 5 minutes. (F) Spontaneous or SDF-1α–induced migration speed of Jurkat cells after silencing of PANX1 or treatment with CBX (100 μM; see also Supplemental Video 3; *P < 0.05, #P < 0.05 by Kruskal-Wallis test). Data in B (migration speed), C, and F represent mean ± SD of 60 cells analyzed in 3 independent experiments. Data in B (ATP release) and E represent mean ± SD of 3 independent experiments; *P < 0.05 vs. control (1-way ANOVA); #P < 0.05 (unpaired 2-tailed t test).